I see pictures on beauty blogs and makeup forums all the time of people’s “battlestations” – i.e. gorgeous vanities. Sadly, I don’t have a gorgeous vanity. 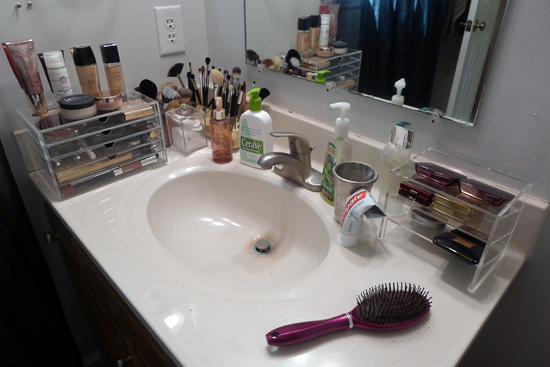 Instead I have a very tiny bathroom that was bursting at the seams between my makeup and skincare collections. Several weeks ago, I decided I’d had enough, and ditched my old cheap-o makeup organizer for some new ones that made better use of what little space I have. 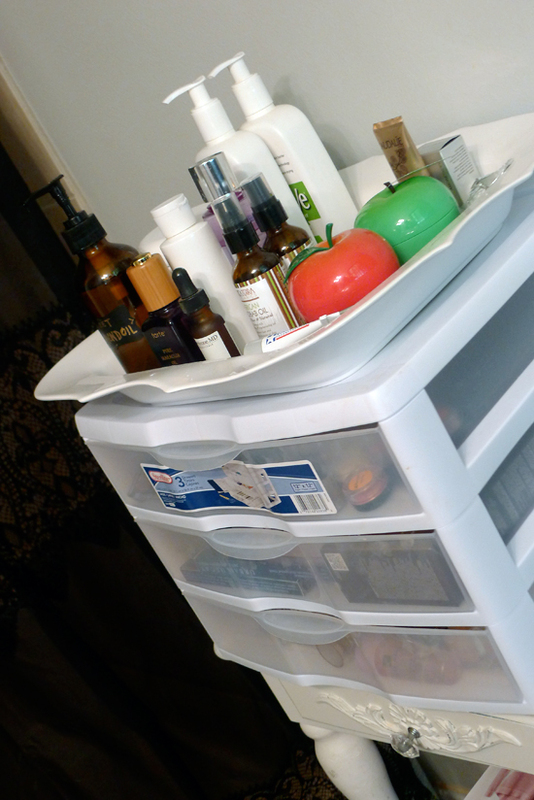 After a lot of research, and a lot of balking at the crazy high prices on makeup storage drawer systems ($100-$300! 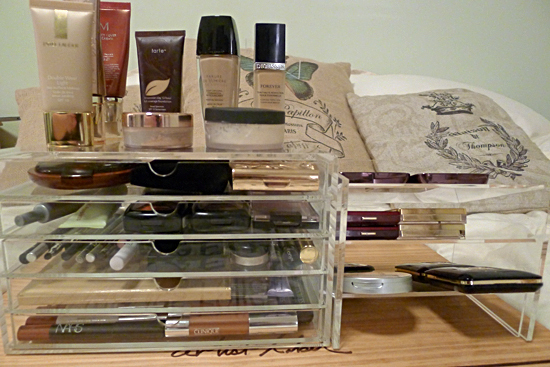 ), I decided on the much more affordable Muji Acrylic 5 Drawer Case ($27) and a Muji Acrylic Rack ($20). The Muji 5 Drawer Case sells out frequently, so I actually had to wait a few weeks for it to come back in stock. I was finally able to order it last week, and they arrived at my door on Monday. I spent all of Thursday morning reorganizing my makeup collection, and I have to say – I couldn’t have been happier with the outcome! I photo-documented the whole process, so I hope y’all are ready for a ton of photos of my makeup collection. 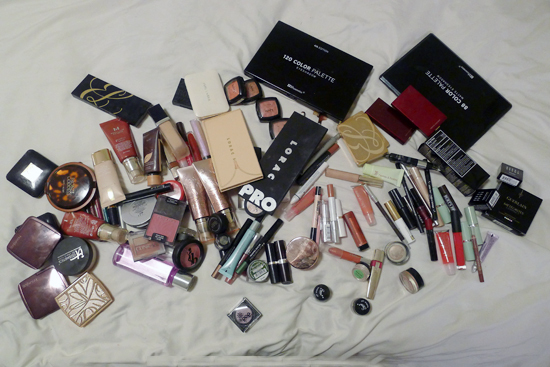 This is my entire makeup collection, in one big pile on my bed. Not as big of a collection as many I’ve seen, but I’m very happy with it. 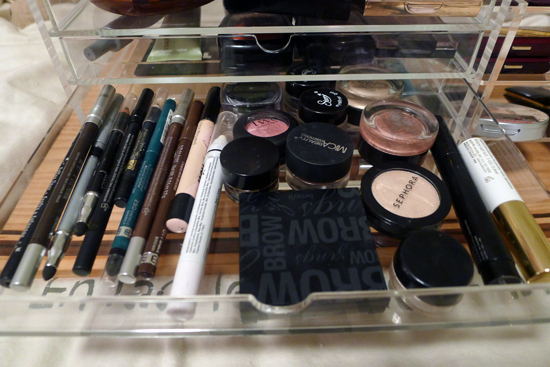 This is the Muji Acrylic 5 Drawer Case, ready for some makeup action! 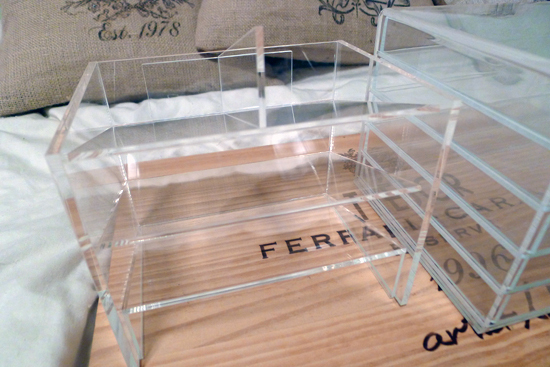 This is the Muji Acrylic Rack! The first order of business was to organize my collection into groups. 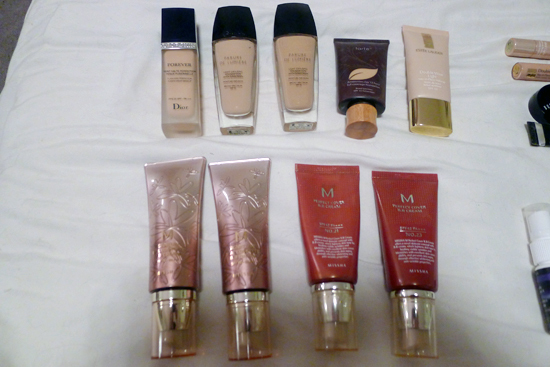 These are my foundations & BB Creams. 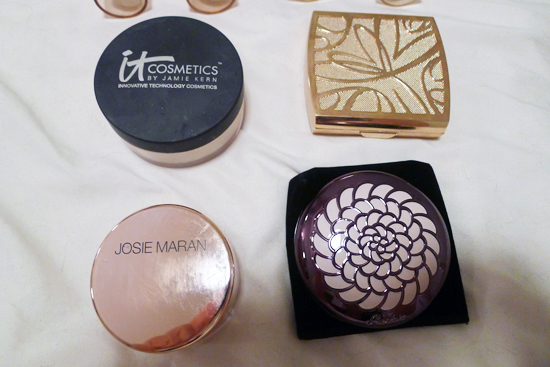 Here are my setting powders and pressed powders! 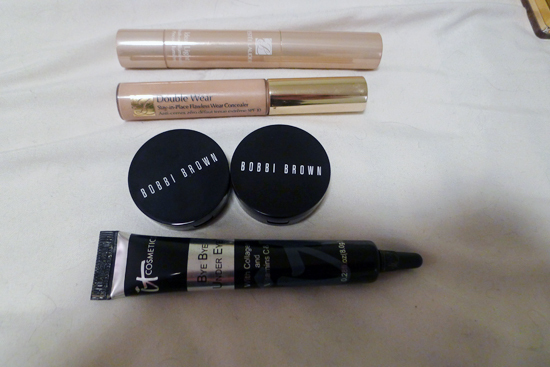 My primers & setting spray! 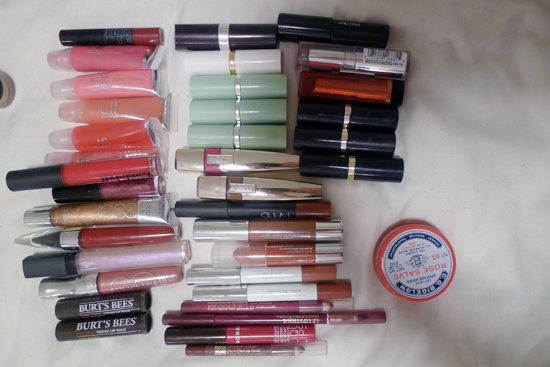 My lip colors and lip balms! I have way too many to list, but I love them all. 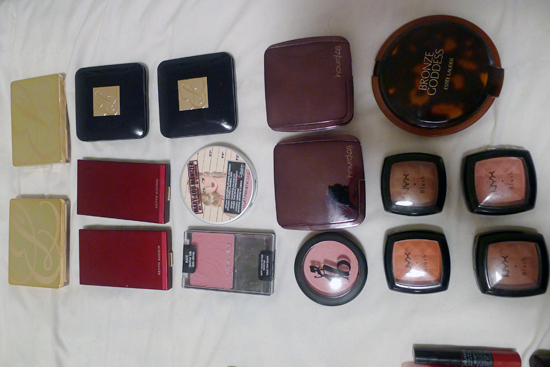 These are my highlighters, bronzers, and blushes. Again, too many to list! 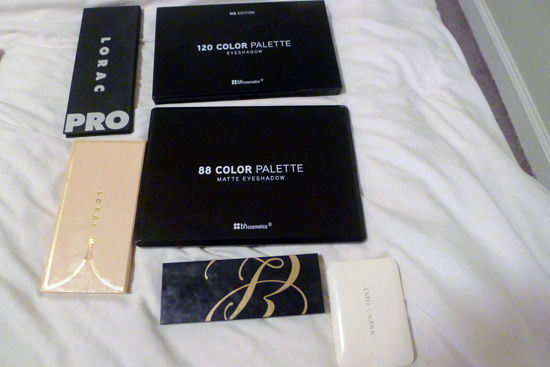 Here are my eye palettes! Some miscellaneous Estée Lauder palettes I received in past GWPs. 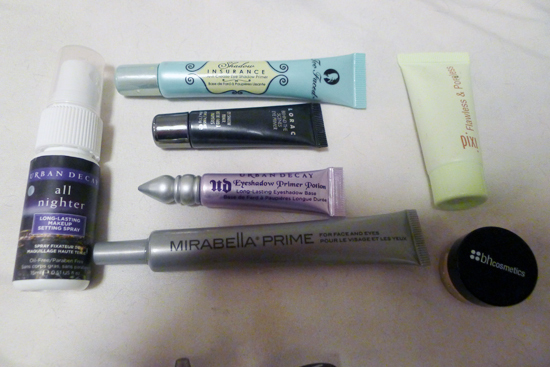 These are the rest of my eye products. 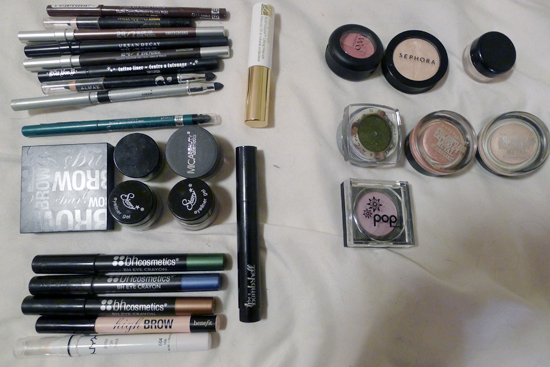 Again, too many to list, but my favorite products in this pile are the Benefit Brow Zings in Dark and my Urban Decay 24/7 Glide on Eye Pencils. 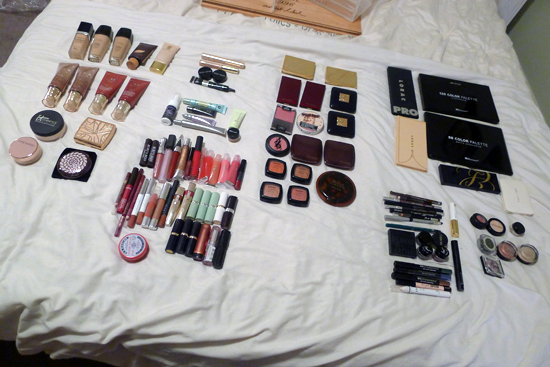 The next order of business was to get all this makeup into their proper Muji cases! I was able to fit most of the products in these cases. 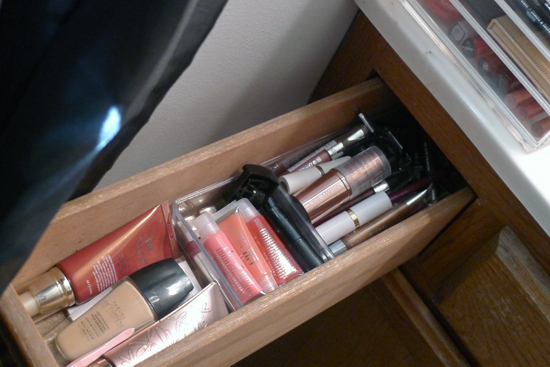 There were some lip products that didn’t make the cut so they’ll live in my bathroom drawer. I was also unable to fit my BH eyeshadow palettes in either of the cases, so they went back into my backup drawers, which I’ll show you in just a bit. My concealers, powders, and setting spray all went into the top drawer. 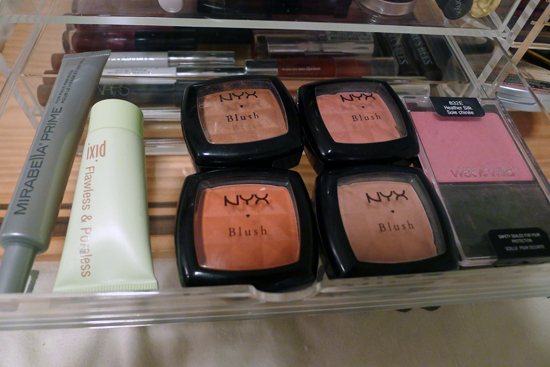 The second drawer was dedicated to the blushes and face primers. The third drawer is dedicated to all my eyeliners and shadow singles. They’re shown in the bottom drawer here, but I later rearranged the drawer order, moving this one to the second slot. 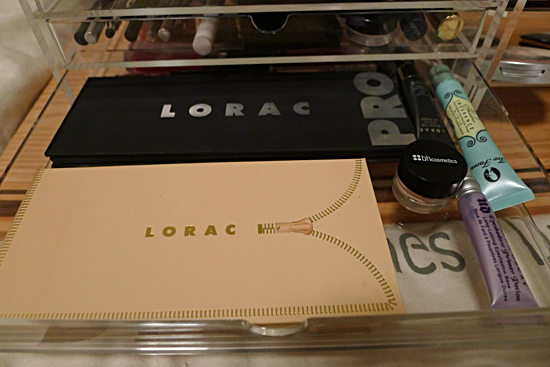 The fourth drawer is dedicated to my higher end palettes and eye primers. 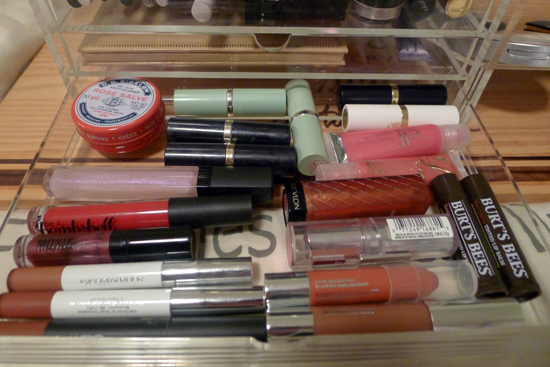 Here are all the lip products that made the cut for the bottom drawer. The ones that didn’t make the cut will be stored in my regular bathroom drawer. The rest of my highlighter, bronzers, and blushes went into the rack, but I forgot to photograph it, so you’ll just have to imagine its beauty. The final step was to move these babies into my teeny, tiny bathroom. Here it is! My tiny bathroom with my beautiful new makeup storage! The remaining lip products and my foundation colors that aren’t in season went into my microscopic bathroom drawer. These are the backup drawers where I store empty boxes (yes, I save them), as well as the BH Cosmetics palettes that didn’t fit in the racks. 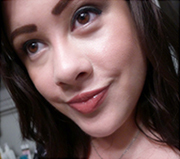 On top are a lot of the skincare products I use on a regular basis. Those cute apple containers are Tony Moly products I’ll be reviewing in the near future! 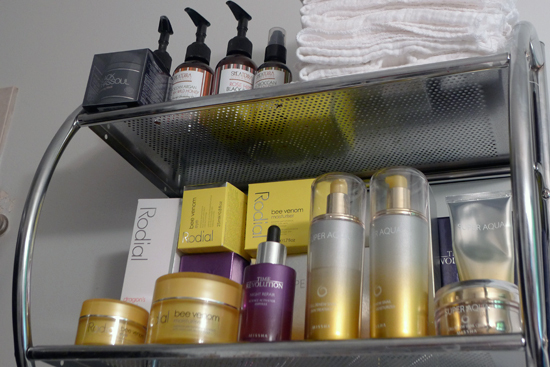 And here’s a bonus shot of my skincare shelf above the backup drawers! How do you store your makeup? Do you have a vanity, or is your bathroom your battlestation? Oooh, I love organization posts! Very nice — and I can’t wait to read your Tony Moly pack reviews…I’ve been itching to get some, based on the packaging alone! I’m also really surprised I don’t see any MAC products! Haha! You know, there are actually a ton of MAC lipsticks I want, but I have yet to find a MAC foundation that I’m totally in love with. I recently tried their Studio Fix (my skin is too dry for it) and Studio Tech (too much of a pain to apply compared to my other foundations), so I returned both of them. But mark my words, there will be some MAC lipsticks in my collection very soon! I have that SAME metal shelf in the master bath. Target. HA HA HA! It’s a great shelf! I think I ordered mine on Amazon. I love your organizing! I will have to look into Muji products for my own storage. 🙂 Which of the Hourglass Ambient Lighting Powders do you have? I just purchased one in ‘Dim Light’ and am curious about what others think about these powders. The Muji cases really are worth it! 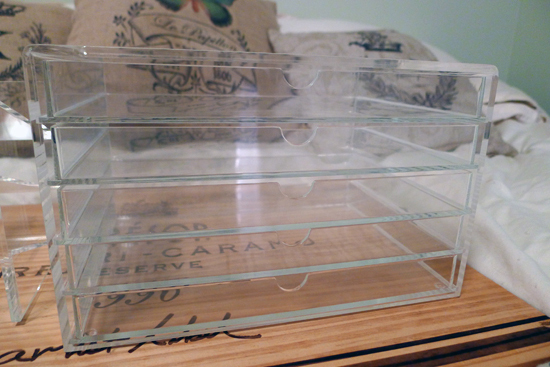 They’re a nice size and they are so much cheaper than the acrylic makeup storage drawers I saw on eBay. Seriously, those things are crazy expensive. I have the Dim Light and I have the Diffused Light. I am not in love with them, but I don’t hate them. I think I expected the effect to be a little more miraculous. When I use Dim Light as an all over color, it makes me look like I have a subtle but unnatural tan. I have been using it for subtle contouring instead, and though I like the effect, I don’t like it so much that I would pay $45 for it again. The Diffused Light, which is a pale yellow powder, doesn’t do much for me. It’s not light enough to highlight, and though I have heard that it balances out redness, I don’t think I have enough redness to see it do much for me. People LOVE this one though, and I keep trying to use it with the idea that maybe I’m just missing something. I may try exchanging it for Mood Light or Ethereal Light. What do you think of yours so far? Are you using it as an all over powder? I felt the same way! Yes, I bought Dim Light because I was looking for an all over sheer setting powder to apply over my Missha BB cream (actually the same one you reviewed, which I absolutely love!). I’ve been using the powder for about a week and I think I’m liking it more but the effect seems so subtle I don’t understand all the hype. Sure it gives a finished look but I too thought it would look AMAZING given all the glowing reviews. Seems like an ordinary neutral powder. I do like that it’s paraben, talc, etc-free though. I guess it gives me a bit of color but I can’t notice it all that much. I agree the price is really steep, although I purchased during the Sephora sale so I feel a tiny bit better. But I’m glad to know I’m not the only one who felt this way! I saw that Jessica Alba and Emily Blunt were wearing these in Radiant Light at the Golden Globes but I swatched it at the store and it was SO glittery and tan…sigh. Wondering if I should try any of the others or just give up on this product. I love, love, love seeing people’s collections and storage. I used to have something simliar until my collection got out of control. I now use some scrapbook storage and it works awesome! I think the clear ones are a great idea so you can actually see your items. Oh, the scrapbook storage sounds interesting! What do they look like? I love my Muji drawers right now, but I predict that I will have to expand my storage again in 6 months. Isn’t it? I love these drawers. I see many more Muji drawers in my future! I LOVE MUJI STORAGE! I just love the fact you can expand it as your makeup collection grows! You have tons of makeup omg haha! I’ve actually just uploaded my first blog post on my muji storage, would love it if you could check it out and give feedback! This is a nice re-organization. 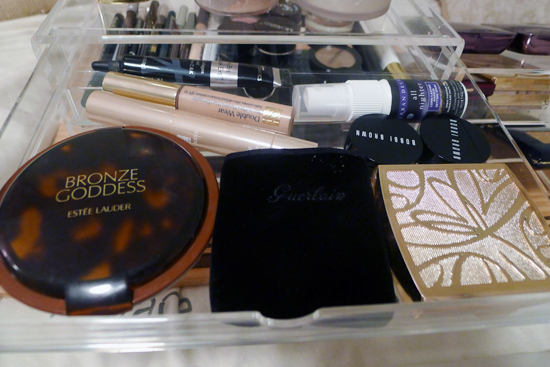 I keep my makeup organized in a few nested cardboard boxes. Feel free to laugh. I keep them in my bedroom so they are not near the bathroom’s humidity. Alas I have no vanity, so I have to grab my kit and head to the lavatory to do my face.